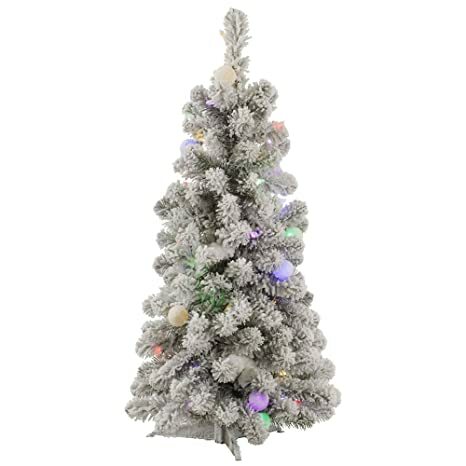 The Vickerman Flocked Kodiak Pre-lit LED Christmas Tree has lush green foliage and natural-looking white flocking. It even comes pre-lit in select bulb colors for instant holiday cheer in the home or office. This Kodiak style Christmas tree comes in a variety of size options. 5-ft. Tree Additional Information Shape: medium Base width: 31 in. Tip count: 557 Bulb count: 285 6-ft. Tree Additional Information Shape: medium Base width: 36 in. Tip count: 889 Bulb count: 450 7-ft. Tree Additional Information Shape: medium Base width: 40 in. Tip count: 1333 Bulb count: 555 8-ft. Tree Additional Information Shape: medium Base width: 44 in. Tip count: 1669 Bulb count: 715 9-ft. Tree Additional Information Shape: medium Base width: 50 in. Tip count: 2145 Bulb count: 925 Don’t Forget to Fluff! Simply start at the top and work in a spiral motion down the tree. For best results, you’ll want to start from the inside and work out, making sure to touch every branch, positioning them up and down in a variety of ways, checking for any open spaces as you go.As you work your way down, the spiral motion will ensure that you won’t have any gaps. And by touching every branch you’ll create the desired full, natural look. About Vickerman This product is proudly made by Vickerman, a leader in high quality holiday decor. Founded in 1940, the Vickerman Company has established itself as an innovative company dedicated to exceeding the expectations of their customers. With a wide variety of remarkably realistic looking foliage, greenery and beautiful trees, Vickerman is a name you can trust for helping you create beloved holiday memories year after year. Choose from available size options. Realistic PE/PVC needles for a lush look. Choose from available tip options. Comes pre-lit in select bulb color options. Green foliage with white flocking. Includes metal stand. 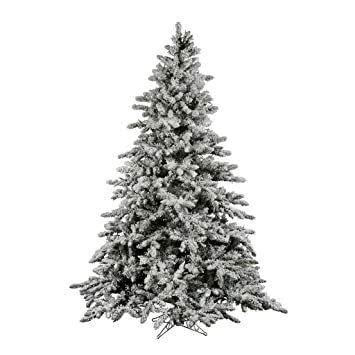 4.5′ Flocked Utica Fir Tree with 492 PVC Tips. Includes Metal Hinged Branch Construction and Metal Stand. 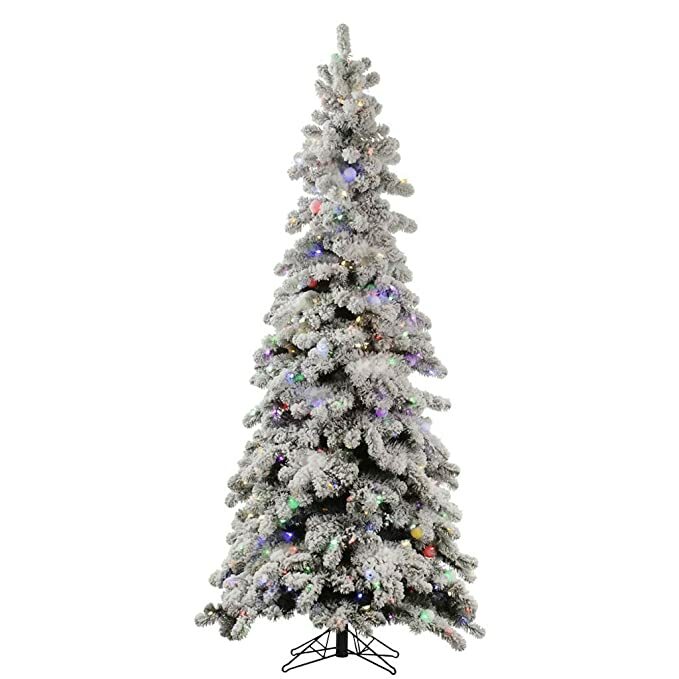 4.5′ X 44″ Prelit Flocked Alaskan with 349 Tips and 300 Multicolored Lights, Heavily Flocked. Includes Metal Stand. 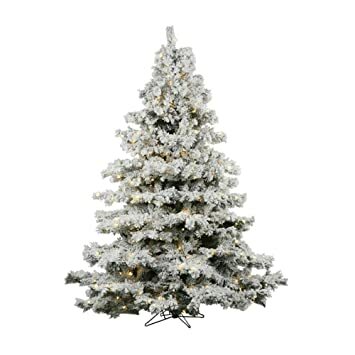 6.5′ Flocked White Slim Tree 744 PVC Tips and Snow 300 Dura-Lit Clear Lights with On/Off Switch Step. Metal Stand. 3′ x 20Medium flocked Kodiak mini, 120 tips, UL 50 led multi Italian mini + 15 led multi G40 light, in plastic base, 100percent PVC, 0.07+0.11+0.11 thickness. Vickerman company is an importer and wholesaler of quality seasonal decorations including traditional and realistic artificial Christmas trees, wreaths and garlands. In addition the company offers other realistic looking holiday foliage, Giant Christmas trees and a full line of unique display trees. 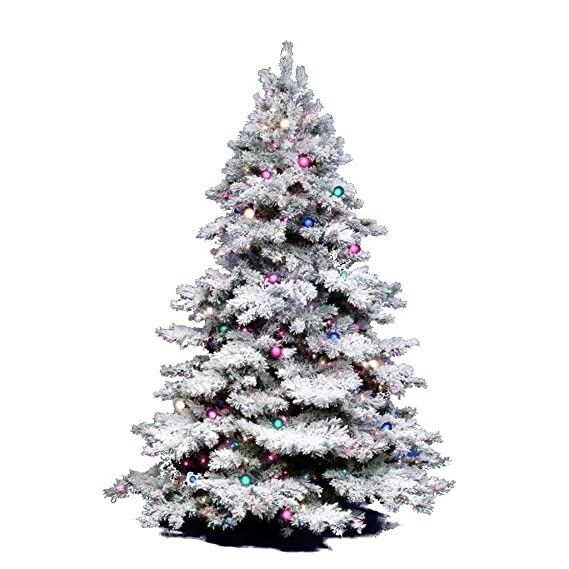 A146832LED Vickerman Flocked Kodiak Artificial Christmas Tree with 50 Multi-Colored LED and 15 Multi-Colored G40 LED Lights, 3′ x 20"
4.5′ x 46Flocked Alberta tree featuring 382 PVC tips, pine cones, and 250 warm white Italian led lights. A folding metal tree stand is included. Vickerman company is an importer and wholesaler of quality seasonal decorations including traditional and realistic artificial Christmas trees, wreaths and garlands. In addition the company offers other realistic looking holiday foliage, Giant Christmas trees and a full line of unique display trees. 6.5′ X 62″ Prelit Flocked Alaskan with 1045 Tips and 600 Clear Mini Lights, Heavily Flocked. Includes Metal Stand. 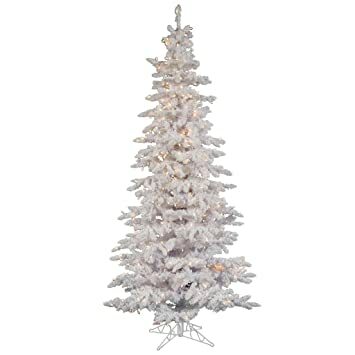 A155246LED Vickerman Flocked Alberta Artificial Christmas Tree with Artificial Pine Cones and 250 Warm White LED Lights, 4.5′ x 46"
7.5′ x 68″ Flocked Alaskan Tree with 1495 PVC Tips and 900 Warm White LED Mini Lights, Metal Hinged Branch Construction. Includes Metal Stand. 3.5′ x 35Flocked Alberta tree featuring 198 PVC tips, pine cones, and 150 warm white Italian led lights. A folding metal tree stand is included. Vickerman company is an importer and wholesaler of quality seasonal decorations including traditional and realistic artificial Christmas trees, wreaths and garlands. In addition the company offers other realistic looking holiday foliage, Giant Christmas trees and a full line of unique display trees. 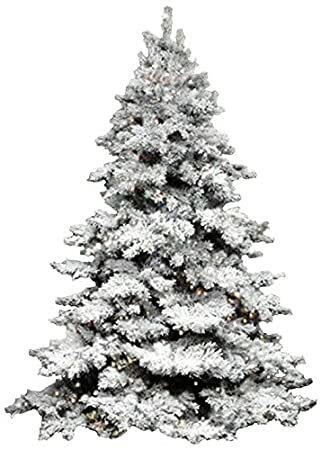 7.5′ Flocked Utica Tree 1650 PVC Tips 850 Dura-Lit Clear Lights with On/Off Switch Step. Includes Metal Stand. A155236LED Vickerman Flocked Alberta Artificial Christmas Tree with Artificial Pine Cones and 150 Warm White LED Lights, 3.5′ x 35"